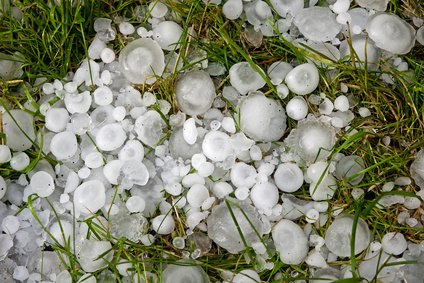 Hail can occur in any season, but is most prevalent in late winter and spring. Hail damage is one of the most common roofing problems, ranging from an annoyance to a serious complication. Unfortunately, it is not easy to assess hail damage on all types of roofing. Hail damage to a roof can go unnoticed for months or even years, as it can cause structural damage underneath the roof covering, particularly with asphalt shingles and flat roofing. Also, hail damage is rarely uniform, making it difficult to prevent or prepare for. No type of roof is entirely hail-proof, but some roof materials, such as metal, are more hail resistant than others. However, even if you've got a sturdy roof, knowing how to assess and fix hail damage is a good idea. There are two types of hail damage to a roof – latent and severe. Latent hail damage refers to unseen structural damage inflicted on the roof. Over time, latent damage can lead to cracks and leaks. Severe hail damage refers to immediate leaks caused by a hail storm and can come in the form of cracks, holes, dented flashings or gutters, and split or even missing shingles. If you suspect latent damage, assess your surrounding property. If there is damage to the landscape, siding, windows, or exterior appliances, there is likely damage to your roof. Since it's more extreme in nature, severe hail damage is generally easier to recognize. If you suspect hail damage to your roof, you need to act quickly, as insurance companies often have strict time limits on submitting roof hail damage claims. If you want to recoup the cost of repair, follow your insurance company's guidelines by the book. Firstly, write down the date of the storm, and note any visual signs of hail damage. Next, contact an experienced hail damage certified contractor as soon as possible for an inspection. It's always a good idea to have two or three contractors make an assessment, just to be safe. Then, file your claim with your insurance company. Be sure to include your notes and the contractor's assessment. Try to have the contractor who performed the assessment available when the insurance adjustor comes to perform his own hail damage inspection. For built-up roofing, a sample of your roof may be sent to a forensic engineering lab. Given the complexity of hail damage, it is important to follow your insurance company's guidelines. Always work with a qualified, professional roofer, and never attempt to fix or repair your roof on your own. If you follow the appropriate avenues, and if your roof needs mending, your insurance company will likely cover the cost of a new roof or necessary repairs.